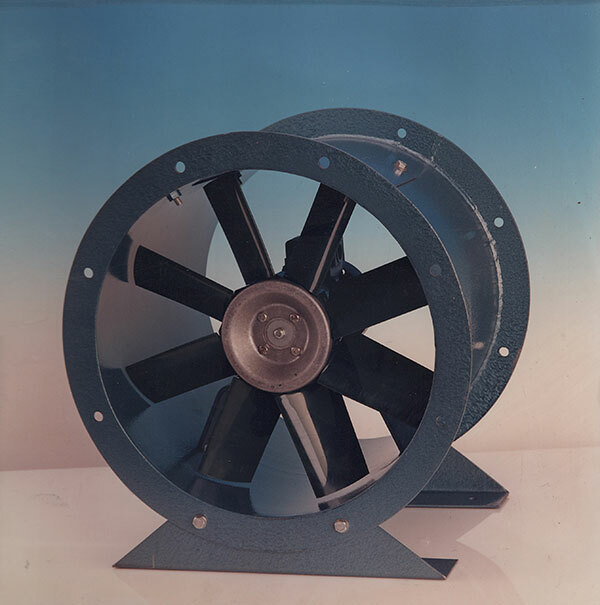 Our Axial Fans can be supplied as both cased and plate mounted versions. These fans are suitable for most applications including general ventilation for large, medium and small industrial spaces. The size of space and purpose will determine which variant and size of fan is most appropriate to your specific requirement. Our experts are on hand to assist you with choosing the correct fan. Direct driven Single or Multi stage fans suitable for vertical or horizontal mounting. By running two Long Cased Fans in series with contra-rotating impellers, it is possible to achieve up to three times the pressure of a single stage fan of equal diameter and speed. In this instance the casing covers the entire length of the motor and impeller and an inspection door is provided. Essentially for duct mounting where flanges are bolted back and front. The casing covers the impeller track and a portion of the motor projects beyond the end of the flange. Best installed at the end of a duct or on Air Conditioning equipment. In most instances foot mounted TEFC IEC 600034-1. Electric motors are fitted with metric dimensions. The motors are selected to cover the ‘peak’ power absorbed for fan blade pitch angle and speed. Most standard motors have Class ‘F’ insulation and are suitable for operating at temperatures of up to 50°C (122°F). Higher temperatures available if required. The standard voltages are 220, 230/380, 380, 240/215 and 460. Motors can be wound for any voltage and frequency and also for dual voltage. The use of standard foot mounted motors of this type guarantees inter-changeability in most countries of the world with machines of similar speed/kw. INVERTER CONTROLLED, FLAMEPROOF, SINGLE PHASE, 2 SPEED AND COMPANY SPECIFICATION MOTORS CAN ALWAYS BE OBTAINED. Impellers have aerofoil section polypropylene blades fitted into a die-cast aluminium hub. Five different blade angles are available and each blade is individually replaceable in the event of breakage. Aluminium blades are also available in selected angles. Impellers have aerofoil variable pitch aluminium blades fixed into a die-cast aluminium hub. All sizes of impellers can supplied with varying number of blades to suit the application. This has the effect of reducing the static capability of the fan whilst retaining a high efficiency. Mounting feet, flexible connections, AV Mountings, Mating Flanges, Inlet Cones, Guards, Back-draught shutters, Special Paint. Finishes: External Terminal Box.